In kendo kata yonhon-me, we have hasso no kamae and waki-gamae. These stances are not used in the modern kendo anymore. * Thanks to Yosuke Kataoka sensei, we realized that Miyazaki sensei accidentally moved his right foot back when taking hasso at around 16 seconds. The left foot should be moved forward when taking hasso. Thank you again Kataoka sensei. However, as we all know, one of the kata’s purposes is to remind us where kendo comes from, so we have these stances even though we do not use them now. Shitachi uses maki-kaeshi with hiraki-ashi. This technique is fairly advanced. If you do not know what hiraki-ashi, you may find it very difficult to get the technique. Maki-kaeshi is also advanced technique. The mechanism of this technique is very useful to acquire the way we use wrists flexibly. Both uchitachi and shitachi should pay extra attention to the distance. Uchitachi should be aware of the distance when both executing a men cut. Shitachi should perform hiraki-ashi well so he/she can cut uchitachi’s men with the correct monouchi part. Uchitachi Hasso Bad Example:The right arm pit is closed up too much. The main point is to hide your sword behind you. Make sure that you don't show your sword while walking toward your opponent. To do so, keep your left shoulder toward your opponent. When the shoulder moves, your body moves. When your body moves, your sword moves. Shitachi takes a step backwards with the right foot and take wakigamae. Bring the sword above the head like taking the migi-jodan with the body facing square with shitachi. Stepping in on to the right foot, strike shomen of shitachi. Stepping in on to the right foot, strike shomen of uchitachi. Lower the sword to the chudan level fighting to take the centre. If necessary adjust the distance by moving your right foot slightly backward. Lower the sword to the chudan level fighting to take the centre. Step forwards onto the right foot and execute a fully committed thrust at shitachi's right lung with the sword turning to the right (the blade faces the right). Shout “YAH!” when thrusting. Lean forwards a bit with kensaki slightly down. Parry by stepping diagonally forward to the left onto the left foot, while lifting the left hand above the head (Technique is called maki-kaeshi). While moving the right foot behind the left foot, strike shomen. Shouts "TOH!". The footwork is called hiraki-ashi. Parrying and striking should be one motion. Go back to the centre onto the left foot recovering from the tsuki position. 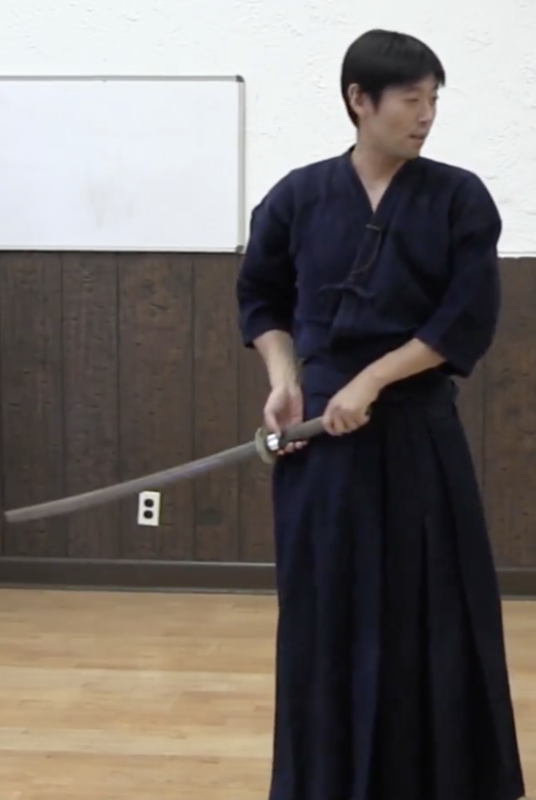 Showing zanshin, go back to the centre onto the right foot while lowering the sword to the chudan. Kamae wo Toku: Lower the sword turning to the right so the blade is diagonally facing down slightly to the left. The kensaki of the sword should be pointing lower than the knee of your opponent. Take five small steps backwards onto the left foot followed by the right foot. (you can cross your legs). The article is contributed by Ed, edited by Hiro Imafuji.